New western variants like Hexes Chess are popping up all the time. This one uses hexagons for spaces, not squares like regular chess or Asian chess variants like Sittuyin. This particular variant was developed in 1991. The hexagonal idea has been around since the mid-nineteenth century. John Jaques and Son developed the first hexagonal chess variant in 1864 calling it Hexagonia. Later games had different board dimensions and different numbers of pieces. Using hexagons instead of squares adds an extra dimension to the board. The pieces have three different directions to move in. There are three shades of hexagons. This gives the pieces, whose moves are consistent with regular chess, heightened mobility. You've got the same pieces you always knew but they are fighting on a different platform. When you look at the hexes board you can appreciate that the game patterns will vary somewhat from what you're used to. While you're getting used to the new arena you may find it difficult to recognize upcoming threats. John Jaques' board had 125 hexagons. His Hexagonia army had a king, 4 cannons, 4 knights and 8 pawns. Wladyslaw Glinski from Poland invented Glinski's Hexagonal Chess in 1936. With 91 hexagons this became the dominant hexagonal variant amassing half a million players worldwide. Mike Layfield from Seattle, Washington on the US west coast was playing regular chess with a friend one day in 1991. He was suddenly struck with a brilliant idea for a chess variant. Use hexagons instead of squares! He had never heard of Glinski's game, only coming across it two years later, but had come up with the same idea. What potential for these pieces if they had another direction to move in! Layfield developed prototypes for his new game. After a series of modifications, tweaks and changes he wound up with a board of 54 hexagons, and two armies, each consisting of a king, a queen, three bishops, one for each of the three shades, two knights, two rooks and six pawns. Hexes Chess was born. The object of the game is to check-mate your opponent's king before he can checkmate yours. 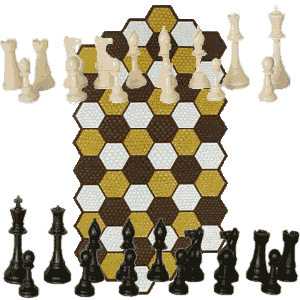 The hexes board gives the king much more mobility than the regular chess board. He has 12 hexagons he can move to when he has full mobility near the center. Any of the 6 adjacent hexagons or any of the 6 nearest hexagons in a diagonal direction. The queen has the same directional capabilities but with maximum range rather than the minimum range of the king. A queen sitting in the center of a empty board controls 30 of the 54 hexagons not counting the one she is occupying. The rook has maximum range orthagonically in any direction. The bishop has maximum range diagonally in any direction. The knight moves two hexagons in any of six directions orthagonically, then either forward-left or forward-right to an adjacent hexagon. Knghts always move to a hexagon of a different color. Pawns move forward either straight ahead or one hexagon diagonally forward left or right. They can move two hexagons straight ahead on the first move only. If their first move is a capture the option to move two hexagons straight ahead one time is still open. They capture by taking on the adjacent hexagon either forward-left or forward-right. Much of the strategic objectives in Hexes Chess are the same as those of regular chess. The execution of these aims is markedly different however owing to the changed nature of the board. Once again the emphasis is on posting your pieces to good hexagons, taking control of space. You need to take control of key files and diagonals in order to win the lion's share of mobility. You force your opponent into placing his pieces in passive posts. When you've gained positional superiority you can use it to acquire additional advantages such as winning material. Ultimately of course all of your efforts are geared towards the capture of the enemy king. You can play this game online in your browser against a computer or other humans. If you prefer you can download a copy for your desktop. Or you can but a physical set with a board and pieces to enjoy a game offline. There are no shortage of resources on the web. Let me point you in the right direction. Hexes Chess is a one of the best western chess variants. The board magnifies the power of the traditional chess pieces. The trick is retraining your mind to see what ranks, files and diagonals the pieces are now controlling. The knights also take a little getting used to. It's not unusual for beginners to get suckered with a smothered mate from an enemy knight in the first couple of moves so watch out for that. A broader overview of chess in general rather than just a look at some of the main variants is available. Maybe the most famous one is Chinese Chess. This link takes you from Circular Chess back to your Homepage. Your Homepage is where you get a site overview. There you can see all of the resources on offer in this web site.